The Pirates are taking over! 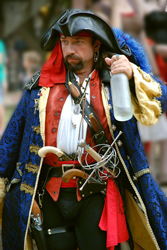 Announcing the Empire.Kred Talk and Walk Like a Pirate Event, happening on September 19-21. Get Ready to win with YOUR “Walk Like A Pirate” video. 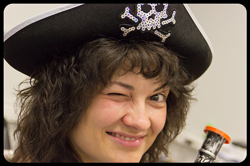 No special skills required… if you have a smartphone and can make a video, get ready to show off your pirate swagger! We will create a thread in Sir Rudiger’s Festival of Fun Community at 7 PM EST on September 19th for you to post a link to the completed video. Videos must be posted by 7 PM EST of Walk Like A Pirate Day, September 20th. All videos will be scored by a panel of 5 judges working independently of each other, and each category will receive a score of 0-5. This will be the basis of 75% of the score for each video. Each judge will send in their score sheet for each video. The judging scores will be tallied with the highest score being assigned a value of 75 and the other scores adjusted proportionally. EK Player voting will be opened with a survey mission from SQRL at 7 PM EST on Walk Like A Pirate Day (September 20) and closed at 3 PM EST on Pirate’s Booty Day (September 21) to permit tabulation. We will do our best to make sure that there are no duplicate votes. Votes will be counted with the highest total being assigned a score of 25 and the other vote tallies assigned scores that are adjusted proportionally. Finally, the judging score and the voting score will be added together and the highest composite score will be the winner. We will attempt to complete tabulation and announce the winner at 8 PM EST on Pirate’s Booty Day. The winner will receive a special Best Pirate Video 2016 Achievement, 1,000,000 Eaves, a special Empire.Kred Blog entry, social media mentions by Empire.Kred accounts and social media missions by SQRL and/or Empire.Kred moderators. Are you ready for your Pirate closeup? Let’s find out!